Jessica De Block is Founder & Marketing Manager at Antwerp Avenue, a tech candy label that sells unique & protective iPhone cases and laptop sleeves -- all designed by Jessica herself. 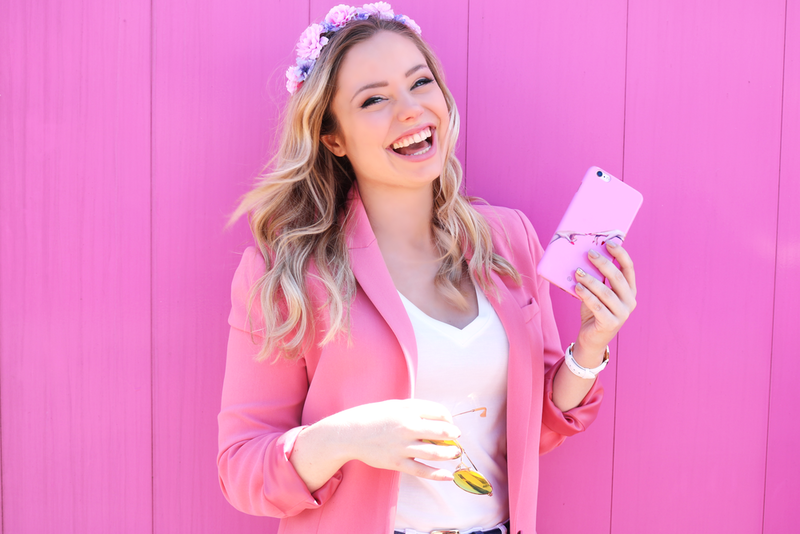 Antwerp Avenue’s main goal is to help the millennial, empowered young woman protect darling gadgets with beautiful designs. Jessica started Antwerp Avenue at the age of 22 (1.5 years ago) while receiving her Masters in Strategic Communications at the University of Antwerp. Antwerp Avenue has since been featured by Cosmopolitan, Seventeen, Allure, HelloGiggles and HerCampus, and has had collabs with brands including Maybelline. I feel like the main thing that sets me apart from other people is probably not what you think it is -- it’s persistence. People like to believe that I became an overnight success, and am doing well "because of talent" or "because she’s been lucky." I can confidently say that neither of those are the reason. I worked hard, literally day and night, while everyone else was partying/sleeping/drinking/chilling. In my humble opinion, the second most important key to my success is the fact that I've always been confident enough to strike the iron while it’s hot. I’ve had so many amazing “in's” and opportunities coming my way, and the only thing I had to do was grasp them with both hands and make the most of it. Had I been too anxious to fail or too busy with what I was doing at the moment, I wouldn’t have gotten to where I am today. Opportunities rarely come at great times, but that doesn’t mean you shouldn’t take them. Take EVERY opportunity you can get. Honestly, I didn't plan for any of this. But I'm very persistent, and I went for it [entrepreneurship]. And if I go for something, I give it my full 200% and nothing less. My toughest obstacle is one that I've yet to overcome: balance. To be completely honest, I'm a workaholic. My job is my baby, and I don’t see that changing any time soon. But that's not the main problem. It’s the fact that you are expected to be in so many places and to do so many things at the same time: spend quality time with your boyfriend, see your family, text your friends back on time, eat healthy, go to the gym, and then... relax. And though relaxation may be one of the most important things in life, it somehow becomes the one you can ignore the longest. Personally, I have to be very careful with this, and I think many entrepreneurs would agree with me. The way I’m trying to overcome it? By actively choosing to relax whenever I have a free moment instead of anxiously filling it up with work "that needs to be done" (but can actually wait until at least Monday). If you’re a workaholic like me, allow yourself to relax from time to time! (I should practice what I preach, too). This isn't a big problem for me. When I love something, staying on track and staying motivated come pretty naturally. But what does increase my focus and motivation is surrounding myself with uplifting people, including great/fun friends and like-minded entrepreneurial people. If you do what you love, motivation is a given. The best piece of advice I’ve ever received may sound cliché, but it has to do with the fact that I'm a workaholic. My best friend Amy from @fastforwardamy and fastforwardamy.com (who used to be my coach before she became my best friend) always tells me that you can’t work on low batteries. She says that I should value my time in monetary value, and even more importantly, in energy levels. That is, even if you’re going to make good money on a job, if it will drain your energy levels, don’t do it. This has stuck with me and I’ve made it my priority to put it into practice. My best advice is to keep an eye out for my current and future Instagram posts on "How to: Girl Boss," in which I give my best advice to entrepreneurs-to-be but also to people who are ambitious in other parts of their lives. I’m trying my very best to make these posts as actionable as possible. My Instagram handle is @jessicadeblock. I may sound naive but I have a feeling we are well on our way. I believe the most structural key to changing the status quo lies with our parents. Parents have the ability to empower their daughters, and I think many of my generation’s parents have done an outstanding job already. As for the others, let’s do a better job with our own kids. Let’s teach girls and boys that girls are capable of anything. Because I honestly believe, deep in my heart, that they are- and have never thought otherwise.